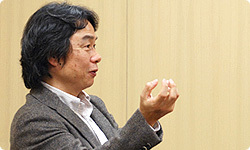 Miyamoto-san, looking back at the history of the Mario series up until now, we have only released one 3D Mario per gaming platform. But Super Mario Galaxy 2 will be the second one for the Wii console.1 Did making it feel similar to when you made Ocarina of Time 2 followed by Majora’s Mask 3? 1The second one for the Wii console: The first one was Super Mario Galaxy , an action game released worldwide for Wii in November 2007. 2The Legend of Zelda: Ocarina of Time: The first game in the Zelda series to appear in 3D. It was released in Europe in December 1998 for the Nintendo 64. 3The Legend of Zelda: Majora’s Mask: Released for the Nintendo 64 in Europe in November 2000, one year and eleven months after Ocarina of Time. Broadly speaking, yes. For Majora’s Mask, we simply adopted the 3D engine from Ocarina of Time, because when you make a new game, it takes a whole year just to make the player-character movements. We had put a lot of effort and time into building an engine that would allow players to feel comfortable controlling the player’s character in the game, so we thought it would be a waste to just build the courses and then call it done. So for Majora’s Mask, we tried packing a high concentration of elements into an extremely compact world. So you set a deadline. That’s right. I wanted the game to be made in one year. I thought if I set a deadline like that we wouldn’t run loose making a bunch of unnecessary new fields. (laughs) And that led to the three-day system4. 4Three-day system: Within the game, the world will end once a certain three-day period has passed, so to keep playing the player must return to the morning of the first day. So just as Majora’s Mask built upon the foundation laid by Ocarina of Time, in making Super Mario Galaxy 2, we re-evaluated the spherical environments of the first Mario Galaxy and noticed some things. Do you mean that you had not made full use of the benefits of spherical environments? Right. 3D Mario games, which started with Super Mario 64 5, always had a miniature landscape the player could move around within freely. They were structured so you gradually came to understand the landscape. Stars were placed around here and there and players could tell just by looking which ones would be easy to get and which ones would be difficult. 5Super Mario 64: The first 3D platform game in the Mario series. It was released in Europe simultaneously with the Nintendo 64 in March 1997. You can put off getting the difficult ones until you’ve improved a little. Exactly. You went back and forth over the same course repeatedly and memorised the landscape. We made Super Mario Galaxy along those same lines, but when we looked back over it, there were lots of places where we could have added new elements to the same environments to make it more fun. So development of Super Mario Galaxy 2 began with using the first game’s environments exactly as they were. That’s right. I wanted it to be finished in one year and started off development under the temporary title of Mario Galaxy 1.5. Not 2, but 1.5. So you wouldn’t get too carried away. Right. We began with the intention of making a game labeled 1.5, but the development staff members were saying things like “It would be fun if we had more environments like this” and “Let’s put in more new stuff.” It was like “More, more, more!” and new environments started multiplying rapidly. The next thing I knew, more than 90% of the courses were new and I couldn’t tell where we had kept anything from the previous game! So in the end, it became 2 rather than 1.5. 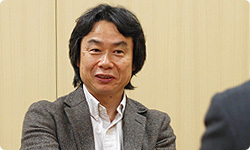 But that wasn’t your only motivation for developing Super Mario Galaxy 2, right? It seems a lot of people are saying things like “Unlike 2D Mario, I get lost in 3D Mario” and “3D Mario is more difficult than 2D Mario, so I can’t do it,” and I had a feeling that you were determined to do something about that sometime. Yes, but I think that we had solved a lot of the problems inherent in 3D Mario games with the first Mario Galaxy. Video: You play on spheres, so if you run around them, you will always return to where you started. You play on spheres, so if you run around them, you will always return to where you started. So you can’t get lost. Right. 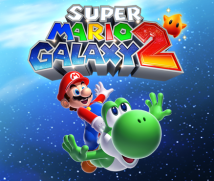 And we noticed something while making Mario Galaxy 2. We often talk about 3D Mario games, but actually you’re just playing in a world made in 3D. What’s fun is the gameplay itself is often still 2D. Well, even if the field itself is 3D, there are objects in it, and Mario. When you look at it from above, it’s actually flat. Video: So if the camera is directly above or straight to the side, you can easily play as if it’s a 2D game. So if the camera is directly above or straight to the side, you can easily play as if it’s a 2D game. Right. But while 2D Mario games only have scenes viewed from the side, 3D games are a refreshing change because they’re flat, but also have depth. Was your desire to create a flat style of play stronger this time than it was before? Video: you can ride Yoshi. you can ride Yoshi. You use the Wii Remote pointer when you have him stick out his tongue. In the last game, you could use the pointer to collect Star Bits. It’s like that this time, too. You can point at a variety of items and press the B Button to have Yoshi stick out his tongue and eat them up. And you can eat chilli pepper this time. to consecutively grab flowers floating in the air in order to lift yourself up to a high spot. You understand such actions in 2D in your brain, but it actually feels like you’re playing them in 3D. topsy-turvy gravity . This was in the last game, too, but it’s much more prominent this time. Gravity flows in the direction of the arrow and suddenly some place that you thought was the ceiling becomes the floor. It’s a really unique course. Yes. It feels like playing with a new toy. That course, too, is sometimes like playing a 2D side-scroller. Of course, it is a 3D world, but you got rid of the places that would be difficult to understand and confusing because of their third dimension. 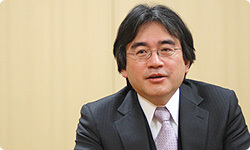 You consciously structured the game so that the essence of the game’s appeal would be two-dimensional. I saw a video of it. Mario holds a drill, digs into the earth, and comes out the opposite side of the planet. Since you play on spheres, we wanted to be able to pass through to the other side of them. And that’s how we used the system of the previous game as a foundation for making a new game that players could comfortably enjoy. When I saw the finished game, I got the impression that it is fully loaded with ideas. I said I wanted the game to be finished in one year, but in the end it took two and a half. There wasn’t any need at the start to spend a year making the player-character movements, though, so you could use the full development period to devise the courses and then make plenty of adjustments. That’s why I think we were able to take our time and pack in so many elements of play.